Two things limited the distances early mariners could sail, one was food the other was fresh water. Early sailing ships needed large quantities of both of these commodoties before any adventures could begin. 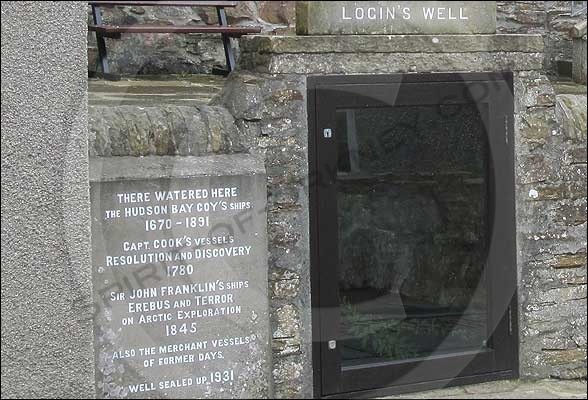 Login’s Well in Stromness, Orkney, is once source of fresh water drawn upon by some of our famous explorers. At first glance the well at the side of a road and surrounded by stone walls is not that impressive. However, once you start to read the engraved stone to the left of the well you realise you are standing in a very important place. Recreate the scene in your head of a bustling harbour scene. Large canvas clad ships tower above the house tops in the bay to your left. Traders, porters and sailors going about their business making preparations. All around you the sound of carts scratching their way up the cobbled streets. The squeaking of hemp ropes passing over wooden pulleys loading cargo and the sloshing of water into wooden barrels. Pitch fires burn at the harbour walls whilst sweaty men loading wagons compliment the smoke filled air you inhale with every breath. Now look back towards the well and become immersed in the atmosphere of the 17oo’s. Stromness became the last port of call before the long voyage across the Atlantic for many vessels. Many Hudson Bay Company ships used Stromness for supplies and men until the early 1900’s. Resolution and Discovery, Captain Cooks‘s vessels, both took on water and supplies in Stromness upon their return home following the failed search for the North-West passage. It was during this adventure that Cook was killed on the 14 February 1779 in Kealakekua Bay, Hawaii. Stromness was the first home port to which the boats, Resolution and Discovery, returned to in August 1780. 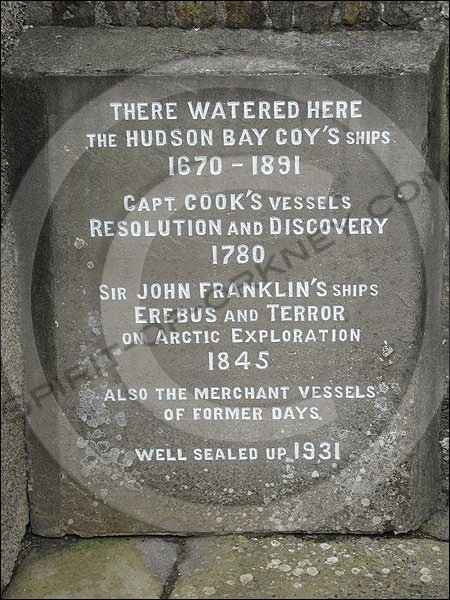 Sir John Frainklin’s ships, HMS Erebus and Terror, also stopped for supplies in Stromness in 1845. The well was sealed in 1931. However, it has since been reopened and a glass door installed so you can once more see the water. Papers mainly relating to the ill-fated Franklin Expedition in search of the North-West Passage on HM Ships Erebus & Terror (1845-7), and the subsequent expeditions sent to search for survivors or relics of the expedition. Also, some earlier letters from Franklin mainly to relatives and letters from relatives to or about him. Some items relating to the bicentenary of Franklin’s birth celebrated in 1986.